If you do not wish to vote at this time, click here to visit Plant Wars stats. Choose to be a cactus, flower, or a tree - each gives you a particular bonus. Join a colony for camaraderie, or stick it alone, fighting other plants indiscriminately. By fertilizing your plant, it grows stronger in its key attributes. They each uniquely affect your battles with other plants. You fight other plants individually and the strongest can fight for their colony. 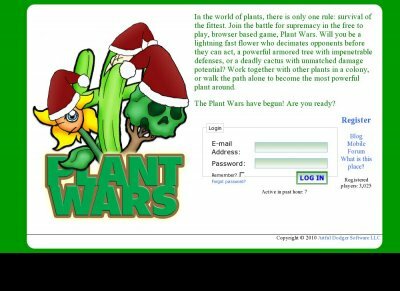 Plant Wars has an active community with innovative ways to communicate. If you're active, you can move up in the ranks quickly. The plant wars have begun! Are you ready?